In Harry Potter and the Goblet of Fire, J.K. Rowling offers up equal parts danger and delight--and any number of dragons, house-elves, and death-defying challenges. Now 14, her orphan hero has only two more weeks with his Muggle relatives before returning to Hogwarts School of Witchcraft and Wizardry. Yet one night a vision harrowing enough to make his lightning-bolt-shaped scar burn has Harry on edge and contacting his godfather-in-hiding, Sirius Black. Happily, the prospect of attending the season's premier sporting event, the Quidditch World Cup, is enough to make Harry momentarily forget that Lord Voldemort and his sinister familiars--the Death Eaters--are out for murder. *This isn't so much of a review as a discussion of my thoughts. I'm assuming most everyone has read this series already, so I refer to connections with the later books. If you haven't read Harry Potter, beware of spoilers. In Goblet of Fire, Harry sees a huge jump downward in his life, an avalanche from happiness to misery and fear. Harry starts out the book as happy as he's ever been. His life isn't perfect, of course: Harry's life is always fraught with worries, annoyances, and danger, but it's about the closest to happiness that Harry will ever see in his childhood. Harry has a godfather who loves him and watches over him. Finally, when Harry has a nightmare or twinge of his scar, he has someone to tell who cares and knows how to react. What's more, Harry gets to go to the Quidditch World Cup with his best friends and his favorite family, the Weasley's. Then as the book gets going, Harry hits a snag when he's selected to be a champion in the Triwizard Cup Tournament and temporarily loses the friendship of Ron, due to Ron's jealousy. But things seem to clear up after awhile. Harry and Ron make up, and Harry is doing well in the Triwizard tasks. Finally, we get to the end of the book. Harry's good fortune plummets. With the death of Cedric and the rise of Voldemort, Harry's life becomes impossibly more difficult. Harry's in for quite a ride. 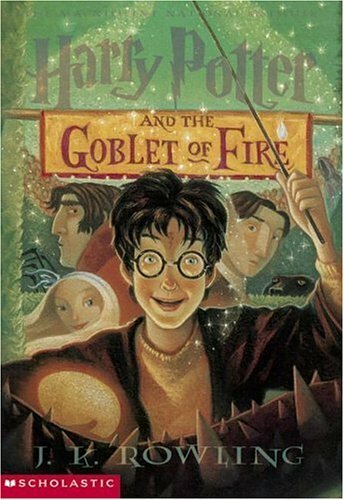 The Goblet Of Fire is the last of the "fun" Harry Potter books. It's really the last time for Harry to be a child. Once Voldemort rises, many of the joys in Harry's life are superseded by more immediate concerns. Harry's at a good age in this one, too. He's starting to get interested in girls, but is still pretty clueless and immature. I love how terrified he was of asking Cho to the dance and his ensuing awkwardness. We also see the first signs of a budding romance between Hermione and Ron. The last one hundred pages of The Goblet Of Fire is a true page-turner. Seeing all of Harry's fears come to fruition was both fascinating and terrifying. Add to that the horror of Cedric's death (who I can now never see as anyone other than Robert Pattinson) and hardly anyone will be able to steal themselves away from the novel. When I was reading the book for the first time, the phone rang when I was at page 675. I got up to answer it, and it was a telemarketer. If I could have wrung the man's neck at that moment, I would have. Even a minute away from the book was killing me. 1. It's interesting that Voldemort refers to Pettigrew as "Wormtail" (p. 13, UK Edition), the name he used with his friends as a schoolboy. I wonder how Voldemort even knew it. I wouldn't think that Peter, who loved being close to power, would have told Voldemort of the nickname or would want to be known as Wormtail by the Dark Lord. It sounds rather undignified. 2. Why does Harry keep Hedwig in a cage? It's not like she's going to fly away and not come back. You'd think these magical, super-intelligent owls could just reside on a perch with a tray beneath it to catch the droppings (or they'd be smart enough to relieve themselves outdoors). 5. We again see how close Draco is to his parents. He goes to the World Cup with his mother and father (p. 91, UK Edition). Also, he didn't go to Durmstrang, because "Mother didn't like the idea of me going to school so far away." (p. 146, UK Edition). A wealthy family like the Malfoys surely could have had a nanny take care of Draco while the parents went off to have fun. But we see again and again just how the parents treasure their son, in their own unpleasant way. It is yet another example of the importance and the power of love. 6. Harry can resist Veelas' siren-like charm a lot better than Ron (p. 113, UK Edition). Perhaps it's similar to how he can easily repel the Imperious Curse (p. 204, UK Edition). 7. I love the theme throughout the series of the tendency of the media to distort the truth. The Daily Prophet rarely gets things right. And when it does, it sensationalizes the truth into something better or worse than it was. 8. Another thing we see throughout the series is references to the Weasley's relative poverty. Harry has loads of money and would be more than happy to share all he has with the Weasley's. But none of them, including Ron, would ever think of asking or accepting money. Ron wore that dreadful dressrobe (p. 139, UK Edition), and Harry practically had to stuff his prize money down the Weasley twins' throats to get them to take it. I think their refusal to benefit from Harry's wealth speaks partially to the family's pride (they don't want to be a charity case), but also demonstrates their character. They never even consider taking advantage of Harry's wealth or fame. 9. I love S.P.E.W. (which I can't help but pronounce "spew"). Hermione is at the age where so many teenage girls get hooked on a cause. SPEW serves as a good vessel for exploring Hermione's personality. In the first three books, she's mostly defined by her book smarts, bossiness, Type-A personality, and bravery. But now we see that she cares deeply about those with less power and fiercely defends anything and everything that's important to her. 10. Again in this book, I wonder about Professor Trelawney. She says, "I fear the thing you dread will indeed come to pass...and perhaps sooner than you may think." (p. 176, UK Edition). Like most psychics, her prophecy is so general that it could refer to virtually anything. It might refer to Voldemort's rise to power or to Sirius's death. But it turns out that both of these things do come to pass, in 9 months and 21 months, respectively. Perhaps Trelawney is unwittingly accurate. 11. The DADA position has long been cursed. No teacher has lasted longer than a year. But technically, Mad-Eye could have stayed a second year had a chosen to do so. He wasn't the teacher in GOF - Barty Crouch, Jr. was. Of course, he had more important things to do once Voldemort returned. 12. It does seem odd that Dumbledore's enchantments on the Goblet Of Fire could be so easily hoodwinked. You'd think he would have thought to require the potential champion to enter the name him/herself. Otherwise, what would have stopped dozens of students from getting an older kid to throw in their name? 13. Why did Dumbledore want this Triwizard Tournament in the first place? I assume it's because he wanted to encourage friendship and unity. It's ironic that this was done by creating a tournament that pits the schools against one another. But simply the exposure to foreign students fosters a familiarity and acceptance that wouldn't be there otherwise. Although this unity really doesn't help Harry beat Voldemort, with the exception of Krum, Fleur, and Madame Maxine. You don't see any Durmstrang or Beauxbatons students at the final battle. 14. When Sirius and Snape meet again (p. 619, UK Edition), both are furious and disgusted. They are alike in many ways. Both of their lives were destroyed by Voldemort and the deaths of Lily and James Potter. Since this happened when they were quite young, neither has really grown up - or at least not to the point where they let go of childhood rivalries. There is legitimate anger on both sides, but I wonder if the Potters had not died if their relationship would have been more like the grown-up Harry and Draco, who can at least acknowledge each other with a respectful nod. hi fellow blogger! new to your blog here. would love if you could return the favor and follow my blog as well. got some awesome giveaways going on! this is the book-series i have never read, just watched all the movies. i guess this should be on my tbr list. . . I liked the Goblet Of Fire a lot, although it isn't my favorite book in the series. Interesting thoughts on it . . .
What a great review, thanks so much for sharing your thoughts on this wonderful, unique book. It is my fave HP book because (as you write) it is the last before darkness descends on the world of Hogwarts. It is such a wonderful story, gets me every time. Very topical with the latest film about to come out here in England. Many thanks for an interesting post Alison, it's been such a long time since I read the books that it was nice to have a refresher. Perfect timing for me to read this post, since the next movie is going to be released this week! I never really realized that Vold. called Pettigrew "wormtail", and I always thought there was more to Trelawney. Sure, all of the warnings that she gives Harry are really vague, but I thought most of them came to pass in some way.